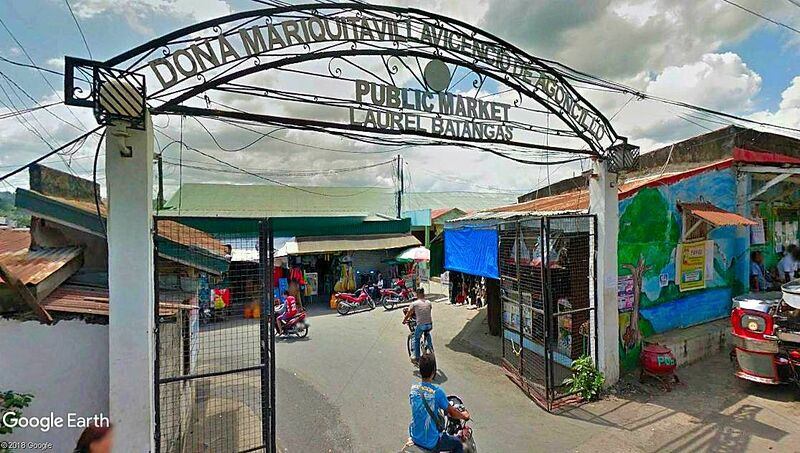 The Public Market in Laurel, Batangas. Image source: Google Earth Street View. The lakeside Municipality of Laurel in Batangas used to be part of Talisay and even Taal during the Spanish colonial era. In the 1960s several barrios of Talisay, determined to become an independent town, had a signed petition forwarded to then-President Diosdado Macapagal through Senator Maria Kalaw Katigbak. This initial effort did not prosper. However, later that decade, a resolution for the separation from Talisay was forwarded to the provincial government who, in turn, endorsed it to Congress. This second effort proved successful and by 1969, Republic Act Number 5689 was passed formally establishing the town of Laurel, named after Jose P. Laurel Sr., President of the 2nd Philippine Republic. Section 1. Barrios Bayuyungan, Ticub, Balakilong, Bugaan, Borinayan, As-is, San Gabriel, and Buso-buso in the Municipality of Talisay, Province of Batangas, are separated from said municipality and constituted into a distinct and independent municipality to be known as the Municipality of Laurel, same province. The seat of government of the new municipality shall be in the present site of Barrio Bayuyungan. Section 2. The first mayor, vice-mayor, and councilors of the new municipality shall be elected in the next general elections for local officials.